You can now watch me being interviewed by Rick Archer from Buddha at the Gas Pump below. Over the centuries, the lives of countless enlightened and self-realised sages have been studied and investigated, contrasting how they were prior to and after enlightenment, searching for clues as to what may aid other seekers in reaching total and complete liberation. Through this investigation several common qualities have been found which, if developed, aid the spiritual seeker to reach their goal. In Vedanta, traditionally, there are four qualities (sadhana catustaya in Sanskrit) that a person should cultivate prior to engaging with the higher teachings of vedanta. These qualities, or qualifications, are deemed necessary to have, at least in some degree, before enlightenment can subsequently be achieved. A similar notion that a certain level of attainment or qualification is required before higher teachings are taught are found throughout spiritual traditions, including many ‘no-path’ schools such as Dzogchen, Mahamudra and Zen (all types of Buddhism). The idea is that without these qualities being present the seeker may have many insights and epiphanies, but the results will be unstable, with insights often coming and going, the results being a continued sense of lack and frustration. In a more mature seeker this may result in so-called ‘flip-flopping’, when the seeker has repeated experiences of being enlightened only to find, much to their dismay, that these experiences also end and suffering resumes. The idea is that without these qualities being present the seeker may have many insights and epiphanies, but the results will be unstable, with insights often coming and going, the results being a continued sense of lack and frustration. Conversely, when a seeker has developed these qualities, when exposed to the higher teachings of vedanta they make quick progress and quickly attain moksha (Freedom), which does not come and go. Ultimate success in spiritual endeavours depends chiefly upon the qualifications of the seeker. Auxiliary conveniences such as time and place all have a place indeed, but they are essentially secondary. Discipline (samadisatkasampatti): dropping trivial activities and turning towards the teaching and what is permanent. (Samadisatkasampatti more literally refers to the six treasures, each of which will be discussed in later posts). Desire for freedom (mumuksutvam): this helps overcomes the ups and downs that life may bring and enables the seeker to overcome obstacles along the way. 17. He alone is considered qualified to inquire after the supreme Reality (Brahman), who has discrimination, detachment, qualities of calmness etc., and a burning desire for liberation. 18. Great sages have spoken of four qualifications for attainment which, when present, succeed in the realization of Brahman and in the absence of which the goal is not attained. Before we look at each of the qualities in turn (in forthcoming articles), I would like to give my view. I don’t think these qualities are definite prerequisites for Freedom or self-realisation, important as they are. I think of them more as risk factors – ie. there may be an increased risk of enlightenment if these qualities are cultivated. Having the qualities does not guarantee enlightenment, and not having them does not bar one from Freedom. It should be obvious really, but just because a particular tradition states something is necessary, doesn’t mean it is so – that’s my take on things at least. For me this Freedom is so simple, beyond simple actually, as it already is, that the whole notion of qualifications seems a bit arbitrary. That being said, I do think they are of importance, and understanding and practising them will benefit many seekers, both in terms of increasing their day-to-day happiness, and in terms of realising Freedom. It has been said that this knowledge of the four qualities required for enlightement has come about by looking at and studying the lives of hundreds of spiritual seekers and knowers-of-Freedom (Jnanis) and seeing if they had anything in common. When we go through each of the four qualities I hope that you will be able to see, in a commonsense way, how these qualities work together and the principles that underlie them, and how they can indeed aid the attainment of moksha (the realisation of Freedom). At the same time I feel it is important that we bear in mind that there are also inherent problems with the notion of qualifications which must also be understood if one is to engage with them effectively, namely that the very idea of a progressive path to Freedom (implied by the need for qualifications) can itself be an obstacle to realising that-which-already-is. I will explore each of the above 4D’s in turn in forthcoming articles. This is a beautiful and profound ‘vajra poem’. It was given spontaneously by Gendun Rinpoche, a late Tibetan Buddhist rinpoche (teacher), during a talk to his disciples. A book of his teachings called Heart Advice from a Mahamudra Master is highly recommended and teaches all the essentials of Tibetan Buddhism from someone who has a genuine experience of the truth that lies behind the words. in open relaxation and letting go. passing judgment upon it and ourselves? again and again, time without end. or a dog chasing its own tail. this freedom and natural ease. in front of your own hearth. Here are some more verses from the Kunjed Gyalpo (The Supreme Source), one of the most important texts in Tibetan Buddhism and Dzogchen. These words point the reader directly towards Enlightenment. See my earlier posts on the Kunjed Gyalpo here and here. In the except below the first section initially directs us to listen to these teachings and realise the inherent liberation that is already present ‘without needing to alter anything’. The second section indicates there is no need for special practices, or to speak or act in a particular way in order to get this. In fact, as per the third section below, in trying to find your ‘authentic condition’ (which is self-liberation), you deny it and prevent liberation manifesting itself. all phenomena self-liberate in the fundamental nature. the teacher self-liberates in the fundamental nature. the retinue of disciples, too, self-liberates in the fundamental nature. there is no need to correct the body posture or visualise a deity. There is no need to correct the voice or speech. There is no need to correct the mind through meditation. In this way one does not achieve the state of equality of the fundamental nature. So, what are we to do? We are essentially told that ‘you are already realised’ or ‘you are already whole’, but perhaps we don’t feel realised or whole. We are told that no practice can take us to where we already are, but then what do we do? 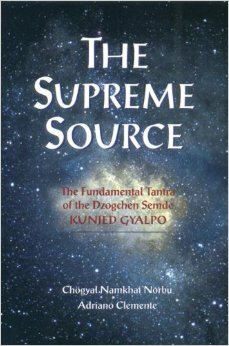 The Kunjed Gyalpo exhorts us to listen to these teachings, absorb them, and see their truth directly! But how to do this, the spiritual seeker asks. There is no how, for in asking how you have already posited and given reality to the separate self that is looking for answer, that is looking to get somewhere. By asking how, there is already the implication that this is not it. But this is it! The Supreme Truth and the way to it cannot be described. Only wrong ways can be described, hence the language is of negation – ‘no need to correct’….’By correcting oneself…one does not achieve’. The scripture tells us what not to do, not what to do. The ancient method is to first listen (sravana) to the teachings repeatedly, then secondly to contemplate them and think them over (manana). This helps to develop an intellectual understanding of the teachings first, following which meditation and integration of the teachings (nididhyasana) can occur. This can occur gradually, or perhaps suddenly, without warning, a moment of clear seeing arises and the teachings that were once theoretical suddenly spring to life. I’ve been reading several blogs and other writings aimed at spiritual seekers who have everything laid out so clearly. They have the map to spiritual enlightenment all put together ready for mass consumption. They say things like you are Pure Consciousness or Pure Awareness. In my previous post I introduced this book which contains arguably the most important text in Dzogchen, the Kunjed Gyalpo, with Dzogchen itself considered by many to be the height of Buddhist teachings. If true, this would mean that this text is the ‘creme-de-la-creme’ of spiritual instruction. For me the text is sublime and poignant and complete. Whilst I think many other teachings are just as ‘high’, reading it makes my heart open and sing, and I offer you some extracts, with my thoughts interspersed with the aim of highlighting important aspects of Dzogchen teachings. Thus states the first line on the back-cover of this treasure-trove of a book. This book is a comprehensive book on Dzogchen, which some say is the highest teaching of Tibetan Buddhism, and is based upon the translation of one of the most ancient and perhaps most important Dzogchen texts, the Kunjed Gyalpo.